Porky's Poutine is a roaming food truck with its usual home base in Riverton, Utah. 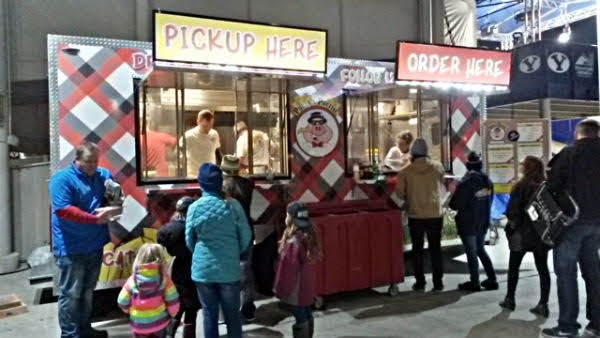 It serves the Salt Lake County area and also can be seen at BYU football home games in the SW corner of the stadium. I found this truck at the BYU football game in Provo. People who know me (or even follow my blog) know I enjoy poutine, that Canadian comfort food of fries, gravy, and cheese curds. So on a cold night, this was a welcome sight to see. The truck has a few different poutines on the menu. 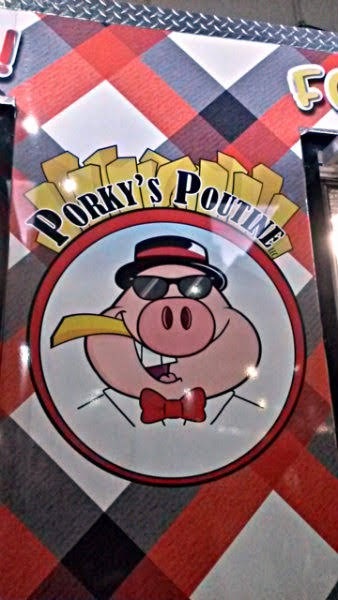 This time, I went with the straight-up Original Poutine ($10), just fries, gravy, and curds. They give a decent portion, which I shared with my mom (only because we wanted to save room to try different foods at the stadium). A very good poutine here. The curds melted slowly from the hot gravy and freshly made fries. It tasted like mushroom gravy, but I could be wrong on that. No squeaky curds that I could detect, but more than acceptable. 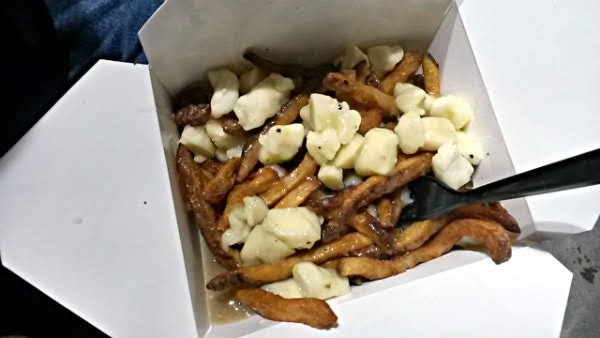 And I personally wouldn't think of finding poutine in Utah. 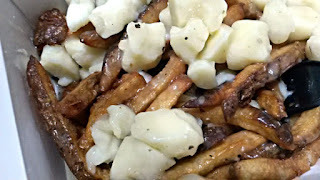 Aside from the original poutine, there are the more flashy poutine options that get topped with stuff. The Philly ($12) includes steak, onions, and peppers. 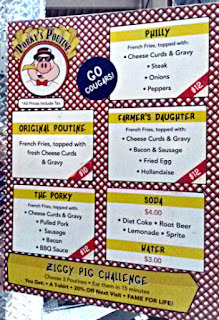 The Farmer's Daughter Poutine ($12) also seemed intriguing, featuring bacon, sausage, fried egg, and hollandaise on top. There may be seasonal options, depending on the time of year. 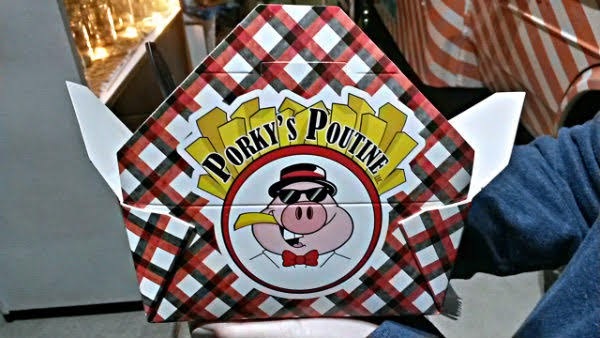 Their website in late October touted a Holiday (Thanksgiving) Poutine that included turkey, stuffing, and cranberry sauce. Last, but not least, there is a food challenge here! One of the few food trucks that I know that still does an active food challenge. 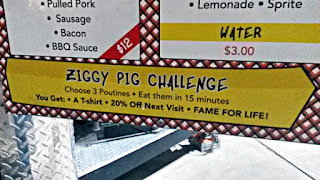 For the Ziggy Pig Challenge, you choose any three poutines and you must eat it all in under 15 minutes. I didn't ask if it was a free meal if finished, or if it's pay-to-play. Winners get a T-shirt, 20% off the next visit, and fame for life. Not sure if that will be enticing enough to get the elite eaters out there, but it's there if anyone is conveniently in the area. As for where they will be, check their Facebook page for their truck schedule.